Indexer, at the right, displays the pages of a book and the index entries for each page. The index entries for the current page are highlighted with a yellow background. With Indexer, you scroll though the book adding/deleting entries for each page. You can also edit and extend the list of terms available to be assigned to pages. as entries. Index terms are listed in a separate window like the one at the right. Double clicking an item adds it as an entry for the current page. Typing in the list window scrolls it to the first term starting with what you have typed. You can have multiple terms window scrolled to different places in the list. 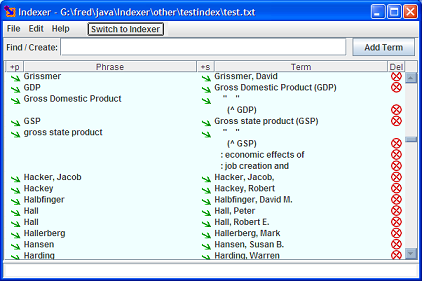 TermsEditor (new in Version 3.3) manages the list of index terms. It displays the terms alphabetically and offers tools for adding, revising, and deleting terms. A good place to start is with the File menu's "Scan for Proper Nouns ..." command. You select text files and it scans them for word strings that might be proper nouns, instantly creating lots of houn phrases; the majority of which should be in the index. Finally, the Create Index menu command combines the entries from all pages to produce an index. See sample at the right. At present other index styles are produced manually. Send your index to me along with the desired format. An item that may appear in the index. It will not appear if no page has an entry for it. term that has been chosen for a page. That term will appear in the index and will have the current page among its page numbers. For instance, if "labor party" is a term and it is added as an entry for page 20. In the final index, the entry for "labor party" will list 20 as one of the pages. The directory with all files for generating an index for one book. The files include the list of all terms, one text file for each chapter, the index entries for each chapter, and the final output index file. Administration, etc. - Details for the dauntless: Installation; formatting; etc.